Tom Gentile writes: The last few weeks of trading have been tough to say the least. After the crash on August 24 that sucked trillions from the markets in a matter of minutes, the markets clawed their way back and held their own for about a week. Then, just two days ago, they fell again, this time dropping by 3%. It’s no secret that I think this volatility will continue, at least in the short-term, and the best way to weather the storm is to make sure you’ve got options in your portfolio. Today, I’m going to tell you about the different kinds of volatility and how they affect the markets generally, and options specifically. Then I’m going to give you a roadmap to deal with the volatility that I see continuing for the next few months, including a few of my favorite options strategies. There are two kinds of volatility that traders talk about with regard to options: Statistical Volatility and Implied Volatility. Statistical Volatility (SV), also referred to as Historical Volatility, doesn’t have much of an impact on options, but there are a few ways options traders can use it to their advantage, as you’ll see in a moment. SV is measured by the prior price moves of a stock, ETF or any underlying security. It is typically calculated by measuring one day’s closing price against the next. It is usually shown as the standard deviation of the security’s daily returns over a lookback period. It is usually an annualized number regardless of the length of that period. When looking at options, SV can be used to compare one underlying with the other. For example if one stock has a higher SV than the other, that would indicate a stock with more telling price moves over a given time period. Statistical Volatility has its place, but it is Implied Volatility (IV) that options traders are most focused on because of its impact on options pricing. IV is a way to see what the markets expect the future volatility in the price of the stock will be between now and a particular option’s expiration. In a sense, IV is a byproduct of the option pricing model. It cannot be calculated, but once the other components are – such as short-term interest rates, time until expiry, strike, price, etc. – then the implied volatility can be assessed. Implied Volatility can be charted, so you don’t have to worry about crunching all this data – your brokerage might even have it available online for you. 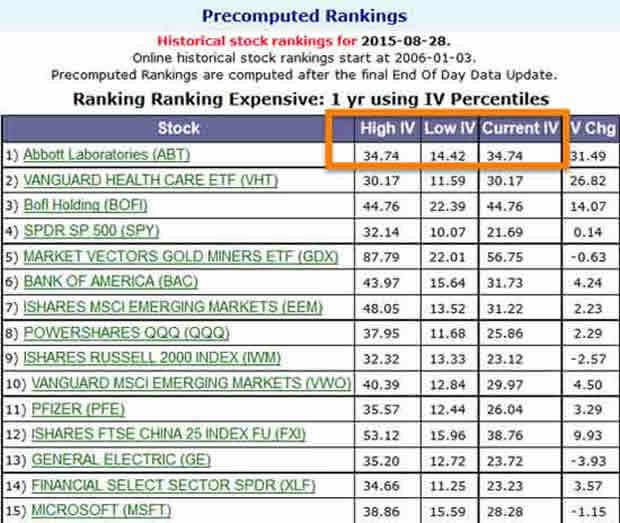 The list below shows stocks and their one-year IV rankings. That allows us to look at the one-year high and the one-year low, and see if a stock is currently at one extreme or the other, or somewhere in between. You can see Abbott Laboratories (NYSE:ABT) is currently at the high range of its one-year IV. In fact, three of the top four stocks are in the same boat. Increased Statistical Volatility is great for us as options traders because, as I’ve said before, one of the biggest detriments to an options trader is a stock that does not move. But as long as this current volatility continues, finding stocks that move enough for us to profit on our options is going to be a snap. So we’re going to continue buying calls and puts, and using our “loophole” trades to take advantage of Statistical Volatility. Here’s another way you can use Statistical Volatility: Measure a stock’s SV vs. an At the Money (ATM) option’s Implied Volatility. If the difference between the stock’s SV and the option’s IV is significant (let’s say the stock’s SV is 25% while the option’s IV is 70%), the numbers could be telling you the markets expect something to happen that may move that stock significantly, like an upcoming earnings announcement or pending FDA approval for one of its drugs. Implied Volatility can be a bit trickier to navigate, but here are a few strategies to keep in mind. What to do in periods of high implied volatility: If you have a situation where the IV is high relative to its past IV, it would be wise to pass on buying options and look for an option strategy where you can sell that option with high IV. Credit Spreads: This is another loophole strategy, very similar to the debit spreads I have recommended in the past. In this trade, however, we receive a net credit for entering the position, and we’re looking for the spreads to narrow or expire for profit. Covered Calls: This strategy involves buying the stock and waiting for it to hit a resistance point. If that resistance point coincides with a spike in IV and if the At the Money or just slightly Out of the Money options have a high IV, you can write calls against the stock, wait for an “IV crush” or a reversion to the means (when IV falls). Then you can buy back those options, pocket the difference, keep the stock, and repeat the process again. What to do in periods of low implied volatility: Periods of low IV are a great time to buy options. Here’s a quick strategy to take advantage of cheaper options. Play the “Volatility Rush” on Earnings: First, take a look at the IV about a week or two before earnings. If it’s low, you can pick up options on the cheap in anticipation of a “Volatility Rush” heading into the earnings announcement. Then as earnings draws near and the IV gets its rush and the value of the option increases, you can sell for a profit a day or two before the earnings announcement (to avoid the risk of a strong gap against them post earnings). This way you’re not playing the earnings announcement, but rather the pre-earnings IV rush. Statistical Volatility, also known as statistical volatility, measures the price movement of a given security; Implied Volatility is what the markets expect the future volatility will be. Statistical Volatility can be used to pinpoint stocks that move in price so we can target the best options. Implied Volatility is an important component of options prices. Investors should buy options during periods of low IV, and sell options during periods of high IV. Be back with you soon.